Special rail services where post is sorted en route have reached the end of the line after more than 160 years of service. The last Travelling Post Office (TPO) services will make their final journeys on Friday night. The trains have been axed under plans which will save the Royal Mail £10m a year and see hundreds of workers redeployed or offered voluntary redundancy. 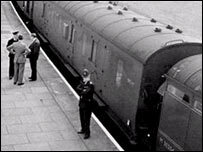 The most infamous incident involving a mail train was the Great Train Robbery in August 1963. The 15-strong gang - including Ronnie Biggs and leader Bruce Reynolds - made off with £2.3m (about £30m in today's terms) in the heist after forcing the train to come to a halt. A spokesman for the Royal Mail said: "Like mail coaches before them, TPOs are now part of the Royal Mail's history, not its future." But trade unions have accused the Royal Mail of "industrial recklessness" and warned of extra pollution as mail is switched to road and air. The first journey by a mail train was in 1838 from London to the Midlands and more than 130 services were in use by the time of the First World War. The Royal Mail said the travelling sorting offices were a Victorian solution to a Victorian problem of moving post around the country before the era of motorways and air travel. The spokesman said the company had invested heavily in hi-tech, automated equipment which sorts 30,000 letters an hour compared with just 3,000 on the trains. But many of the staff - some of whom have worked together for more than 20 years - have expressed their sadness at the end of an era. Steve Griffiths, TPO unit manager, said the end of the service would come as a "big shock" to many of the workers. He said: "It is much more than a job, it is a lifestyle. "From Monday lunchtime until Saturday morning, their whole lives are organised for them, so for a lot of them it is going to be a big shock." But he added: "Although there is a great deal of emotional and sentimental attachment to the TPOs, in the 21st century they are simply not necessary." Billy Hayes, general secretary of the Communication Workers Union, said: "It is not only the end of the line for mail on rail but the start of major congestion on the roads and greater pollution." Bob Crow, general secretary of the Rail Maritime and Transport Union, said: "This is an act of short sightedness that will leave the public and the environment short-changed."